It is the first week of April. Snow is long gone and the ice went out on the river two weeks ago. The birds are back and staking out their territories. The fields are starting to green up. Much different than last year. Spring is certainly on its way. The recent warm weather has been good for getting head start on field work. 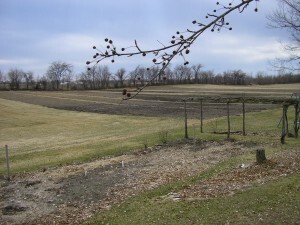 Before last Wednesday’s rain I was able to plow up several beds in the field that was always too wet all last summer. There is still a wet spot where I almost got stuck. See the two grass strips that are wider than the others? On the far end of the near strip, by the tree line there is a spot where the frost had not completely gone out. The frost doesn’t let the water soak in and keep that area wet. I also plowed under all the old cabbage and kale plants to help with the number of cabbage moths this summer. In the fall the mature cabbage worms drop to the ground and pupate just below the soil surface. Plowing buries them too deep for the moths to dig themselves out. I’m sure more will blow in, but when it comes to pests every little bit helps. The greenhouse is filling up again. Yesterday was a good day to put up the plant sale tomatoes. The onions, first kale and lettuce are up. I don’t know if the weather will be warm enough to set them out when they are big enough to go into the field, but if we do get an early spring, they will be ready. If not, they will be salad mix. On the subject of plants, I am growing peppers, eggplant, tomatoes and some various kale, cucumbers, etc. for home gardens. 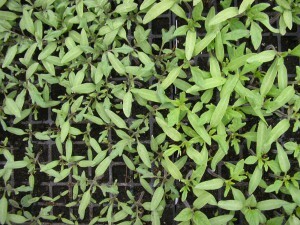 If you would like some locally grown certified organic transplants for your garden, let me know. 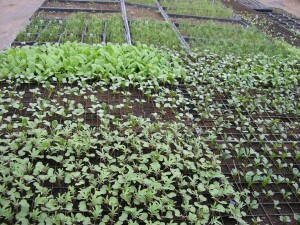 Most of the plants will be from locally grown and adapted seed. I have had it with voles getting into the greenhouse and eating the baby kale or the tender squash. 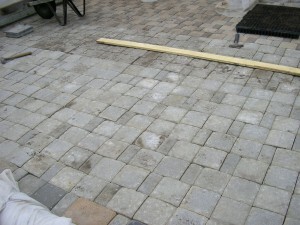 I found a couple thousand square feet of discontinued random pavers to make a hard floor in the greenhouse. The floor will still be porous so the water will drain away but impervious to rodents. A little over half of our CSA shares are sold at this point so if you were a member last year and would like to continue, please get in touch and I will reserve a share for you. One last thing, Mary and I were named MOSES Organic Farmers of the Year at the MOSES Organic Conference in LaCrosse. It was a great honor and a bit of a surprise too.